The artist Jean Tinguely, born in Fribourg and honored citizen of the city, built in 1984 this memorial foutain to his friend and Formula I driver Seppi "Jo" Siffert, accidently killed in 1971 at Brands Hatch. The two men had planned a foutian for Fribourg together in the 1960's. The Siffert monument is the only 20th cen. fountain of artistic interest in Frioburg, and the third "waterwork" by Tinguely in a public place (Carneval Fountain, Basel. 1977; Strawinsky Fountain, Paris, 1983). Tinguely had already proposed the work in 1972 to City Council, but only got approval ten years later, tough has was permitted to choose the location. In the center of an enormous round basin sits the fantastic, spirited black machine, a firework in iron and water. 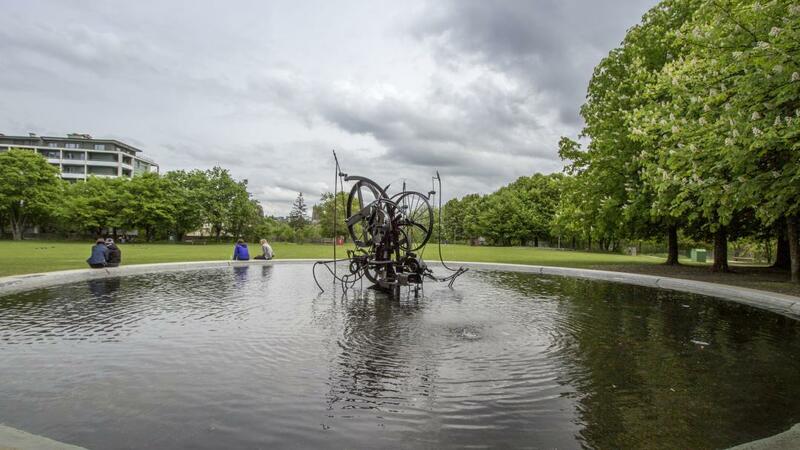 At first it was to have been part of Tinguely's Paris fountain, but he rejected it, only to develop it then further as a separate piece, marvelously effective in thi work.